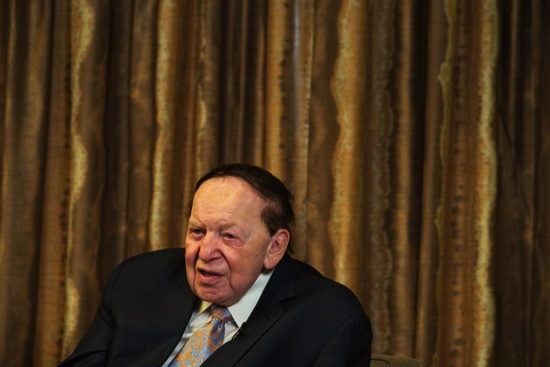 Billionaire casino mogul Sheldon Adelson said Macau’s gambling market has stabilized after Las Vegas Sands Corp.’s unit in the city announced fourth-quarter earnings that fell less than analysts’ estimates. Sands China Ltd. posted adjusted earnings before interest, taxes, depreciation and amortization fell 19 percent to USD581.2 million in the fourth quarter, its parent said in a statement. The figure beat the market estimate of $555 million, according to Karen Tang, an analyst at Deutsche Bank AG. Macau is facing headwinds as China’s crackdown on corruption and a slowing economy have scared away high-end gamblers from the world’s largest gambling market. While the city’s casino takings dropped 21.2 percent in December – falling for the 19th straight month – that represented the smallest year-on-year decline since last January. Sands China has seen its share price slump 30 percent in 2015. Still, the stock gained 14 percent in the fourth quarter as the decline in mass-market revenue has narrowed. It rose as much as 4.9 percent to HKD25.75 in Hong Kong trading, reaching the highest intraday level since Jan. 6. Las Vegas Sands, the world’s largest casino operator, earlier posted fourth-quarter sales and profit that missed analysts’ estimates as gambling revenue in the key markets of Macau and Singapore declined. * Sands’ adjusted earnings in Singapore fell 35 percent to $338.2 million. * In Las Vegas, adjusted earnings rose 25 percent to $97.4 million. * Sales slumped to $2.86 billion, while it raised its quarterly dividend to 72 cents a share for 2016.